Aarti Singh has been awarded has been awarded the A. Nico Habermann Chair of Computer Science, reserved for faculty members who show exceptional promise in the early stages of their careers. Singh’s research focuses on how to extract meaningful information from datasets that are both massive in size and plagued by noise, missing values and inconsistencies, while balancing the competing goals of computational efficiency and optimal accuracy. She is also investigating how interactive algorithms can help achieve these goals by leveraging feedback from human experts to make decisions about how data is gathered and analyzed. The Habermann Chair was established in 1998 in memory of SCS’s first dean and the longtime head of the Computer Science Department. The Air Force Office of Scientific Research has announced that Aarti Singh, assistant professor of machine learning, is one of 42 scientists selected this year to receive research funding for three years through the Air Force's Young Investigator Research Program (YIP). Last year, Singh was the recipient of a National Science Foundation CAREER Award. Singh earned a bachelor's degree in electronics and communication engineering from the University of Delhi in 2001, and master's and Ph.D. degrees in electrical and computer engineering from the University of Wisconsin-Madison in 2003 and 2008, respectively. 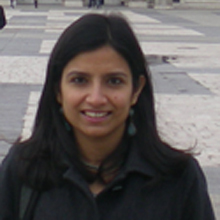 Prior to joining CMU's Machine Learning Department in 2009, she was a postdoctoral research associate at the Program in Applied and Computational Mathematics at Princeton University.